Our Moving and Storage containers are delivered when and where you need it. Our new Robo UNIT delivery system can move and place containers in locations other mobile pod companies can only dream of. UNITS Moving and Storage containers are available in two standard sizes. Our 16’ container holds 3 – 4 rooms of furniture while our 12’ storage container holds 2 – 3 rooms. On average, our portable storage containers are a foot taller than our competition and as much as one foot wider. You load your UNITS portable storage container at your own pace. If something comes up, lock-up the storage container and continue when you have the time. Need labor assistance to load the container… just ask us! Traditional moving and self-storage are a thing of the past. Having to rent a moving truck or take multiple trips back and forth in your own vehicle can be backbreaking. Not with UNITS Moving and Portable Storage. Never again will you have to load and unload your storage container twice. Whether you need your container picked up, relocated to another location, or stored inside our secure storage facility, UNITS Moving and Portable Storage of Sacramento has you covered. Need access, just call ahead. You always have access to your container whether onsite at your location or at our storage facility. Our portable storage warehouse has a gated entrance, cameras, motion sensors and 24/7 security giving you peace of mind. We are also open six days a week to answer your calls and questions. Moving with UNITS is the hassle and stress-free way to move. Ground level loading makes moving a breeze for anyone. Never have to reserve a moving truck and drive it around again. 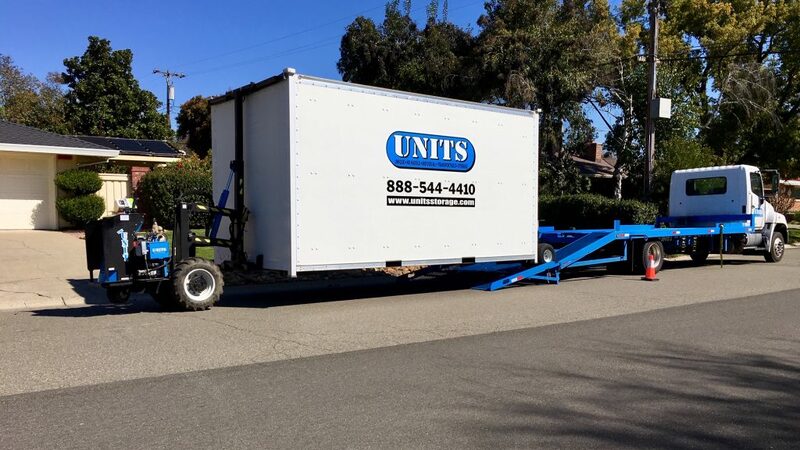 The UNITS container is delivered directly to your home or business when you’re ready. Load your items over a few days, weeks or months. If you get tired of moving or you have an emergency, simply lock the container and finish when the time works best for you. Traditional moving company’s costs are rising. The expense of their moving trucks and employees are going up and that is being pushed onto their customers. Our moving and portable storage containers allow you to take the labor expense out of the equation. 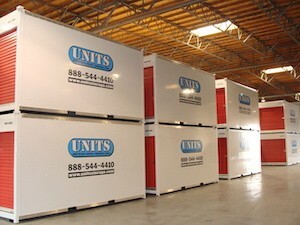 UNITS of Sacramento is no stranger supplying restoration companies with portable storage containers. When a home restoration is needed, use our secure UNITS stored at your residence for all of your belongings as your home is repaired. 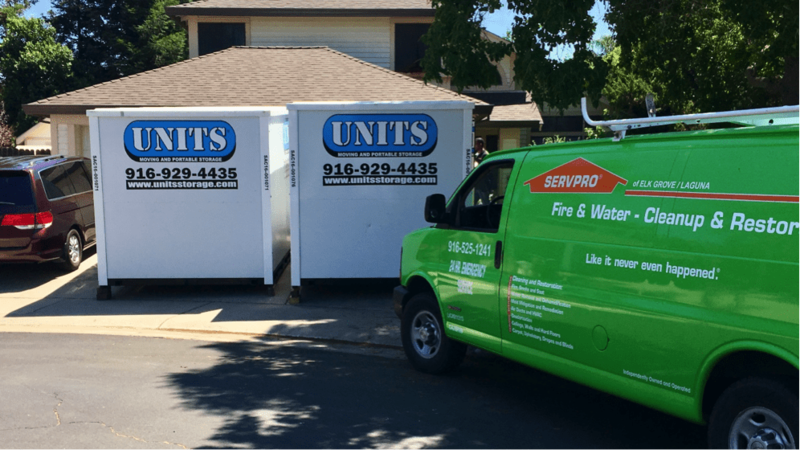 We have years of experience in providing secure mobile storage when emergencies arise for dozens of restoration companies in the Sacramento and surrounding areas. Whether it be a flood, fire or hazardous situation, we understand that time is of the essence and we deliver. Literally! 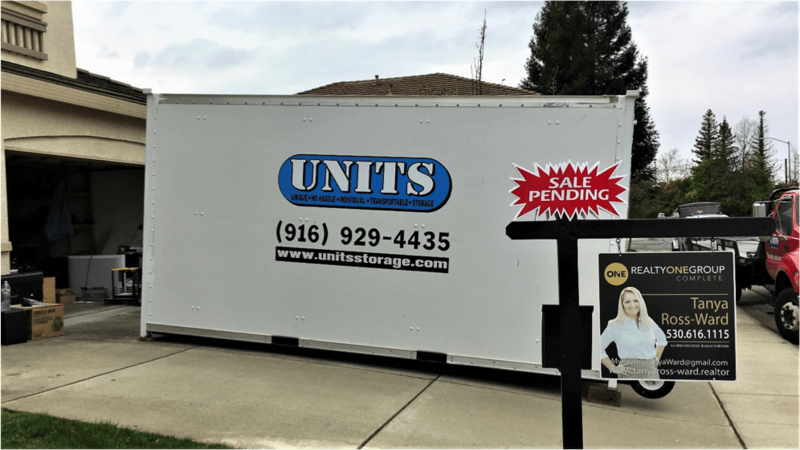 Why Use UNITS Moving and Portable Storage when Buying or Selling your Home? 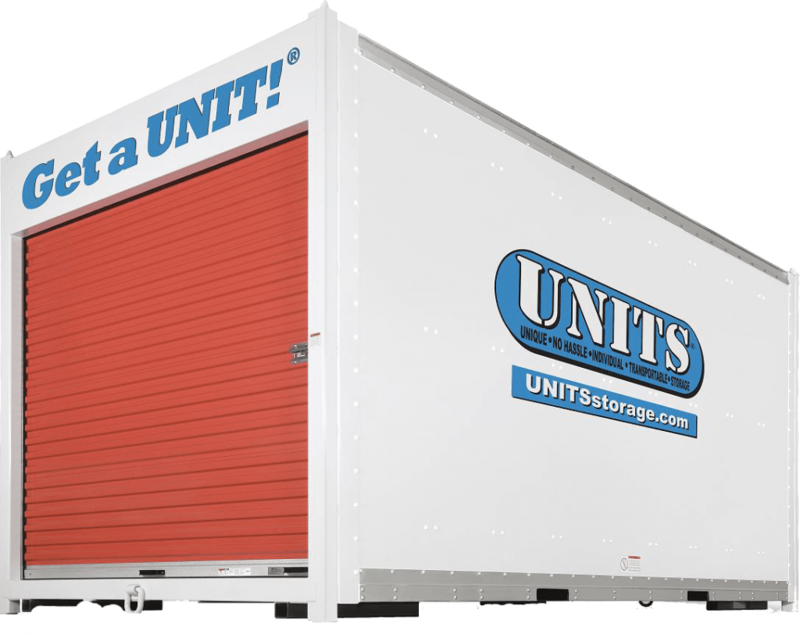 UNITS storage containers offer the most cubic square feet in the industry, whether you’re considering a 12’ or 16’ container. “Our 16’ UNITS container offers up to and in some cases more than 200 cubic square feet than our competitor’s product”. This could obviously result in requiring fewer mobile containers to complete your moving or storage requirements! UNITS Moving and Portable Storage Containers are equipped with E-Track rails throughout. 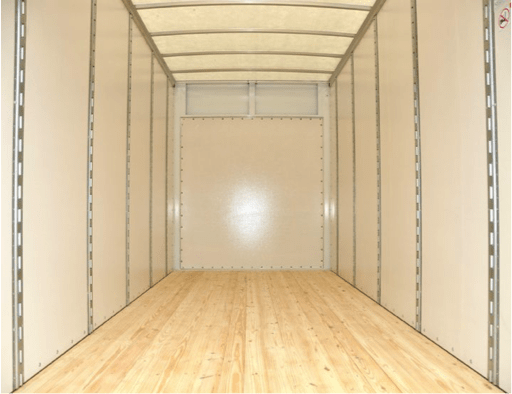 Installed from floor to ceiling and front to back, this integrated system allows you to secure your contents and minimize any shifting during the loading and transportation process. Never tie knots, struggle to untie knots while utilizing our E-strap rentals and Channel Strapping system to help secure your personal belongings inside your UNITS portable container. Our UNITS are three steps ahead of the competition with traditional 2” x 4” treated pine flooring, a Translucent roof to provide you with organic lighting inside the UNITS container and a Channel Strapping system all designed to make your moving experience easier. If you ever need tips on loading, just ask one of our representatives. 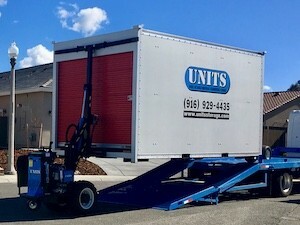 At UNITS Moving and Portable Storage of Sacramento, we are proud of the innovations in moving and portable storage we provide. 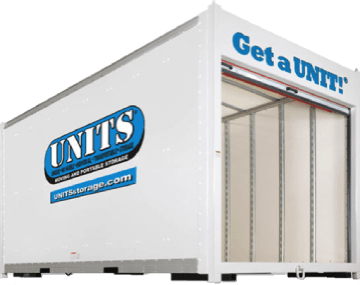 Our UNITS containers offer a more efficient and affordable moving and self-storage alternative to traditional moving companies and storage facilities. Our portable storage containers will help take some of the hassles and worry out of your next moving or storage project. We always work to exceed your expectations!